But did you know that you can enjoy the stunning sight of autumn foliage, WITHOUT having to sit a good 3-4 hours on the bus and then hike uphill? Here’s a heads-up to all of you who want to enjoy Korea’s famous autumn foliage, yet not travel too far from downtown Seoul! First, let’s quickly review the weather forecast for Autumn 2017. Looking at last year’s foliage near Seoul (referring to Bukhansan), in 2017, the period from mid-October to mid-November was perfect for the most impressive scenery which would be pretty similar in 2018. And now, here are 3 tours near Seoul that will let you conveniently explore autumn foliage wonders! Nami island is a man-made island shaped like a crescent. Created in 1944, the island became popular in 2003 as the filming location of Korean Drama Winter Sonata. Nami Island’s famous tree-lined roads that appear in the drama are the absolute must-visit photo spots that everyone should stop by. You can also immerse yourself in nature – hundreds of tall trees and the fresh cool air will welcome you. Feel free to choose among various forest trails that will let you fully take in the vibrant autumn colors, but we also recommend renting bicycles to explore more. The island is not too small, spanning more than 450,000 m². Enjoying water activities such as motorboats and water skiing is a great option too! 3-4 hours on Nami Island should give you a decent amount of time to look around. We highly recommend visiting during weekdays. On weekends, the place will most likely be crowded with so many people trying to catch a glimpse of the island’s beautiful autumn foliage. In addition to Nami Island, there are several other places near the area also worth a day’s visit: ➡ Petite France, Garden of Morning Calm, and Gangchon Rail Bike. Petite France is a French cultural village where you can get a taste of France for a change. Its theme is “Flowers, Stars, and the Little Prince.” To keep up with this dreamy theme, the village features Saint-Exupéry Memorial Hall, Orgel (music box) House, Marionette Dance Performance, and so much more, letting visitors experience traditional Europe. Petite France is also the filming location of several popular K-dramas including You Who Came from the Stars, Secret Garden, and Beethoven Virus. Spanning over 30,000㎡, this beautiful garden was designed by a professor of horticulture in 1996, and since has been attracting many visitors in all four seasons with its poised elegance and classic landscape. In autumn, the Garden holds the Wild Chrysanthemum Exhibition, Chrysanthemum Exhibition, and Maple Festival that accentuate its seasonal scenery. For those of you looking for picturesque photo spots, we couldn’t recommend this place more! Gangchon Rail Bike used to be an actual train track connecting Seoul and Chuncheon that stopped operating as of December 20, 2010. The Rail Bike trail, between the old Gangchon Station and Gimyujeong Station, is about 8 km long and takes about 50 minutes of easy pedaling through variously themed tunnels. Bukhan River flows right next to the tracks, so the Rail Bike is yet another superb activity to view the amazing natural scenery. Indiway offers a number of tours that will take you to Nami Island and other nearby destinations. Once you choose where you would like to visit, be sure to check out the tour of your choice from the list below. For your convenience, all of these packages include round-trip transportation from Seoul, English-speaking staff, as well as entrance fees. Gyeongbokgung, Changdeokgung, Deoksugung, Gyeongheegung, and Changgyeonggung. Many of you reading this post right now will probably have heard of these palaces at least once. But did you know that these palaces look even more classic and grandiose amidst the reds, oranges, and golds of the autumn foliage? Plus, they’re right in the city, surrounding Jongno and Gwanghwamun Square area, thus easily accessible via public transportation. Gyeongbok Palace is the largest and perhaps the most beautiful. It was built in 1395, in the very early stages of Joseon Dynasty, and was used as the main palace. Although it was greatly damaged by fire during the Japanese Invasion in 1592, the palace was reconstructed towards the end of Joseon Dynasty and once again used as the main palace. The grandeur of Gyeongbok Palace indeed reflects the strict yet dignified aura of the Joseon royalty. Among the 5 palaces, Changdeok Palace is the only one enlisted as a UNESCO World Heritage site. This palace is known to be the least destroyed of the five. The architecture arguably holds the deepest touches of original Korean mood and thought – Changdeok Palace is one of the most environment-friendly palaces in Northeast Asia. That is, this palace was built with the very least amount of modifications to surrounding nature. Palace tours would be great for a half-day trip, just as offered in the list of guided tours below. Together with traditional palace walls in the background, the autumnal tints look especially marvelous. Although the palaces are right next to downtown Seoul, you’ll feel as if you’re so far away from the bustling city. Here’s our tip to you: definitely consider renting Hanbok when you visit these palaces! Admission tickets are included in the above Indiway tours, but if you decide to visit the palaces on your own, admission to Gyeongbok Palace is free for those wearing Hanbok. Wearing Hanbok will be perfect for an even more traditional moment at the royal palaces, as well as creating a great photo shoot experience. Also, Hanbok has just the right thickness for the cool autumn weather! Korean Folk Village (KFV) is showcasing traditional Korean culture and lifestyle of the 19th-century. You can see everything from old homes of peasant and of aristocratic, farm life, demonstrations of how the Koreans made straw shoes, rice cakes, silk, etc. 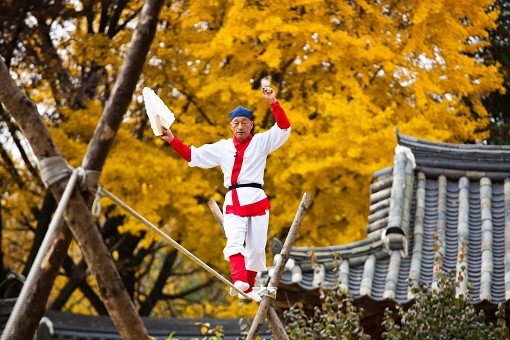 Performances such as tightrope walking, traditional music and many more are taking places everywhere so not only will you be able to enjoy Korean Autumn foliage in a very unique place but also be kept entertained all day long. Read More Posts about Autumn Foliage in Korea! – Autumn Roadtrip in Korea – Naejangsan, Damyang, Boseong!